Split Surface: How Does it Work? In response to last week’s post on Cleaning Up Topo Edges, several people pointed out that this could also be done with Split Surface. Using Split Surface hadn’t even occurred to me, since I so infrequently use it. There is usually no reason to split a Toposurface, but this seems like an obvious and practical use of the Split Surface tool. After testing it out, it does indeed work for cleaning up an edge and it keeps the contours and triangulation the same. But if you know how Topo works, then Split surface must be adding some points along the edge of both surfaces (otherwise the contours and triangulation would not be maintained). So to figure out how it was generating these points, I created a simple surface with a reference plane as a guide for the split line. And then split the surface. Here is what the points look like in the new lower surface. 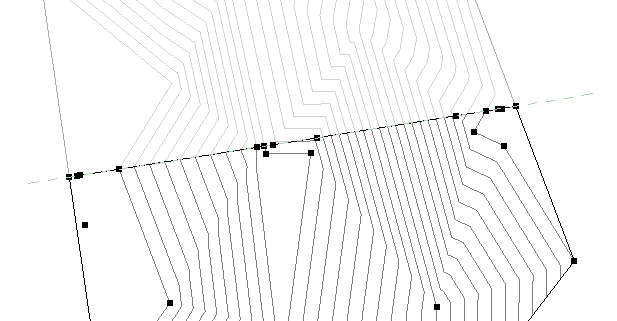 Revit added 13 points along the line in order to split the surface and maintain the current triangulation (and thus maintain the contours). So how does it maintain the triangulation? 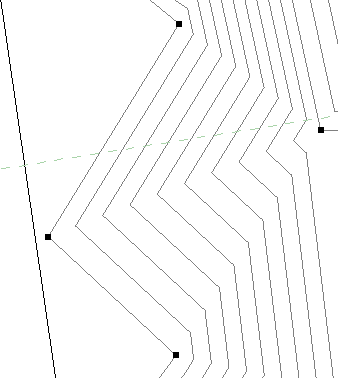 Well if you turn the contours off and turn triangulation on it becomes quite clear. 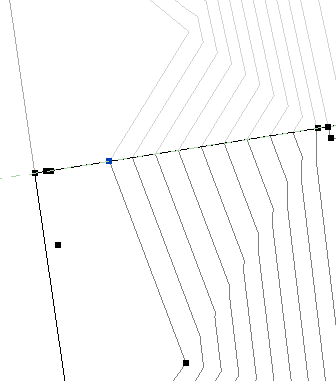 Revit adds points where the triangulation intersects the split line. This is why the new points appear in clusters near the existing points. But even though the triangulation is similar, adding points does result in a slightly different triangulation. So in most cases it will maintain the same contours, but not always. In fact, even on this simple surface, there was a difference between the contours. But that is just how Revit Topo works. It determines how the points triangulate, whether the triangulation is accurate or not. So watch out for that if you’re using Split Surface.